Loved it, ordered one for my mother in law. I am impressed with the quick delivery of the bracelet. It is very nice looking. I love it. It is so nice. Only wish I would of got it in the small size! Very beautiful!!! I am extremely pleased with the mother's bracelets that I purchased. I'm so glad I saw you add on facebook. I think these bracelets will be cherished for years to come. The pictures online really don't do the bracelets justice. Can't wait for these gifts to be opened! 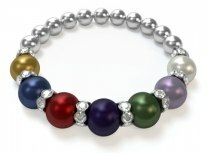 This bracelet is just beautiful! I gave it to my husband to wrap and give to me for Christmas so I haven't gotten to wear it yet. Can't wait! I bought this for my mom for Christmas. The price was perfect and the pictures do not do it justice. It is absolutely beautiful. The bracelet is just beautiful.. I love it and intend on ordering more for family. It was a great price and crafted just beautiful. 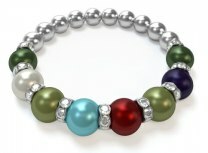 I was a bit disappointed that the colors of the pearls are not as bright and vibrant as photographed. The sapphire, ruby, amethyst, and were actually much darker. The emerald was more like a forest green. Sorry, but I felt a bit let down. I just want to let you know that I received my bracelet today and it is quite beautiful. It's even nicer than I imagined. The quality is awesome. I am giving it to my mom and the 8 beads on the bracelet are for each one of her grandchildren. Thank you again. Very satisfied with the bracelet. It might be a little big so is it adjustable somehow? It's for someone who wears probably size 16 in clothes. Might fit her just fine but won't know until Christmas.